SPECIAL REPORT: Europe’s engagement with fragile and conflict-prone states is increasingly becoming the mainstay of its developmental work, the EU development commissioner, Andris Piebalgs, has told EURACTIV in an exclusive interview. For the first time ever, four countries were last month classified by the UN as facing severe ‘Level 3’ emergencies – the highest classification of a humanitarian crisis: Syria, Iraq, South Sudan and Central African Republic. “Our engagement in those last ones, the fragile and conflict-affected countries, is increasingly becoming the rule, rather than the exception,” he said. Piebalgs words paralleled those of the UN’s assistant secretary-general, Kyung-wha Kang who on 28 August told the UN Security Council that “grave human rights violations have become the norm in Syria”. Kang said that the real death toll in Syria was “likely to be much higher” than the official figure of 191,000 people. She also said that close to a million people in Aleppo were being deprived of water access, and that almost one Syrian in two was now a refugee or an internally displaced person (IDP). “We do have a renewed sense of emergency,” Piebalgs affirmed. “Aid to refugees and internally displaced people needs to be delivered fast and efficiently.” It also had to be put in the perspective of longer-term development principles, he argued. In Syria, these have been challenged by the advance of the fundamentalist Islamic State (IS) group, which now controls vast swathes of Syria and Iraq. In one Syrian town, Deir-Ez-Zor, up to 700 members of the Al-Sheitaat Arab tribe, whom the IS accuse of apostasy, were reportedly kidnapped or killed last month. Some were beheaded or crucified. 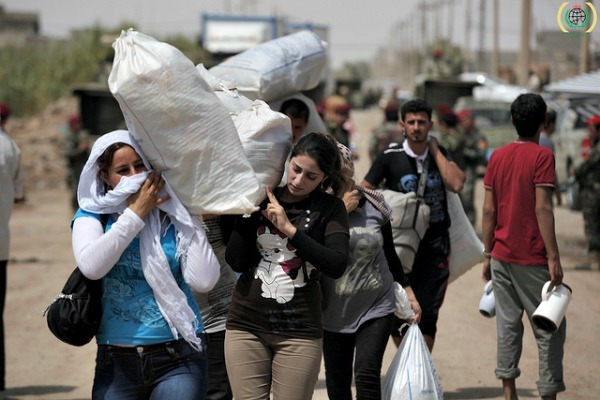 Women from the tribe are said to have been sold on markets in Iraq. The IS’s lightning offensive in Iraq garnered world attention and triggered US air strikes against the militia’s positions around Mount Sinjar – where thousands of Yazidi tribespeople were besieged – and Mosul. It also poses questions for the EU. Since 2003, the bloc has contributed more than €1 billion to Iraq in recovery, reconstruction and humanitarian aid, with €75 million already pencilled in for the coming budgetary period. But EU aid delivery has been affected by the issue of aid disbursement within Iraq’s sectarian, fractious and often corrupt political structures which are thought to have increased support for IS among disaffected Iraqi Sunnis, and alienated many of the country’s majority Shias, as well as Kurds. The EU is already Iraq’s largest trade partner – after the US – with bilateral trade totalling €17.5 billion in 2012, €4.7 billion of which was made of European exports such as machinery, transport equipment, chemicals, food and live animals. Iraq: A strategic energy partner? Oil made up 99.7% of the €12.8 billion of EU imports from Iraq that year, and the bloc sees “substantial potential” for Iraq to become a “strategic energy partner”. Political instability is a barrier to such developments – as well as being a transmission line for strife and humanitarian duress. The European Council on 30 August called for “all Iraqi leaders to form a truly inclusive government,” following the resignation of the country’s prime minister, Nouri al-Maliki, last month, and his succession by Haider al-Abadi, who has US support. The council conclusions offered support to a reformist Iraqi government, and said that the bloc “remains committed to provide humanitarian assistance” to populations affected by the IS group. “Development aid in Iraq will support this political process by tackling the roots of the current violence and bolstering long term structural stability,” he added. The EU is now using conflict-sensitive programming to ensure that aid projects do not single out clans, or ethnic or religious groups for benefits. The EU’s development directorate has also ear-marked €1.5 billion for national resilience strategies in the Sahel and West Africa. Responding to criticisms that the EU should focus more on conflict prevention, reported by EURACTIV yesterday, Piebalgs said that stability and development were two sides of the same coin. The EU is present in crisis zones around the world including Syria, Afghanistan, the occupied Palestinian territory, the Sahel region and many other parts of Africa, central and South America and south-east Asia. It provides development assistance and humanitarian relief, with a stated focus on the full disaster cycle – prevention, preparedness, response and recovery. In 2012 alone, the EU provided assistance to 122 million people in over 90 non-EU countries.